DESCRIPTION Toddler Travel is always full of preparation...you need what seems like an endless list of items for diapering, feeding, and entertainment. Here are some of our suggestions for organizing and carrying these items to make it easier. A carry-on that has sections and pockets and a shoulder strap will be very handy. Baby Backpacks, Roomy Diaper bags or the traditional carry on bag with strap are good choices. This bag should be able to fit under the seat in front of you. You will find yourself constantly getting things out....snacks, diapers, bottles, toys and books. This will be especially true with children under two years of age. Organizing items into different sections of your bag will make it easier to reach in and grab things without hauling it onto your lap to search for things. 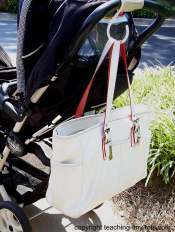 Need a diaper bag but not ready to give up the designer bag? Coach offers a constantly changing line of diaper bags that come with a pad that can be used to change diapers. 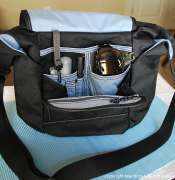 Most have pockets on either end which can carry sippy cups or bottles or even a child's thermos. Use a flexible cozie to keep fluids cold. With pockets for phone and small items, it often has almost hidden long zippered pockets great for separating your wallet. The main compartment also often has a long slip pocket as well. This is definitely a bag that has both quality and style. I still use mine that I have had for four years and it looks great with almost no wear visible! Your second carry on should hold your personal items and important documents like passport, tickets and ID's. Keep these documents in a separate pocket for easy access and less opportunity of misplacing them. Fanny or Mountainsmith Kinetic II Bag like the one shown in the photo are good choices because they keep your hands free and your important items will be on your person at all times. This particular lumbar pack has a pocket on either side for water bottles. The main compartment has a small zippered mesh pocket and a clip for keys. 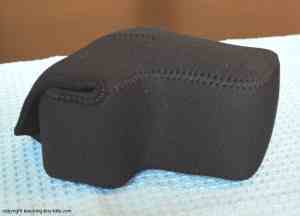 Small padded front pocket for glasses. Approximately 8 x 8 x 3 inches. Here is another option for carrying personal items and a little bit more. It's the Overland Equipment Donner Purse - Women's with lots of compartments that lays relatively flat against your body but can also hold my Nikon D-60. The front has an organizer pocket with a slot for pens, pocket for glasses, two additional pockets for small items and a small zippered mesh pocket. There is a slip pocket in the back and a zippered main compartment with one slip pocket in the interior. It has two pockets on either side that will hold a water bottle. For those of you who carry your camera on every special occasion...here are a couple suggestions. This Digital Series Soft pouch is made by Op/Tech USA. Perfect for when you just wanted to carry your SLR without a big camera bag. It will help keep out dust and moisture while providing a slight cushion against impact. It has a strap which attaches to either the the lens, snaps onto the camera strap or you can screw in a small piece in the the tripod screw and snap it on there. There are different sizes so it does pay off to do a little research and find the one that will fit your camera best. After looking at many designs I found this one that offers some neat features. You can wear it over one shoulder, strap it on to keep from moving and remove camera without taking the bag completely off like a regular camera backpack. It has a pull out rain shield that has come in handy on more than one occasion and a few pockets to hold personal items. 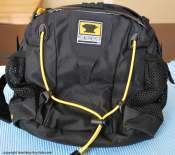 Call directly to Lowepro if you have a question on what size will fit your needs. A comfortable camera strap is recommended if you are going to sling it arount your neck or across your body. There are numerous brands so it's a matter of preference. 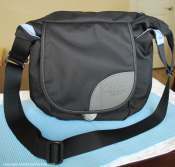 Have a suggestions for a toddler travel bag? Feel free to contact us! !